French police have arrested several suspects after the attack at the satirical Charlie Hebdo newspaper in Paris, which killed 10 journalists and two policemen. The authorities raised security levels in the French capital. 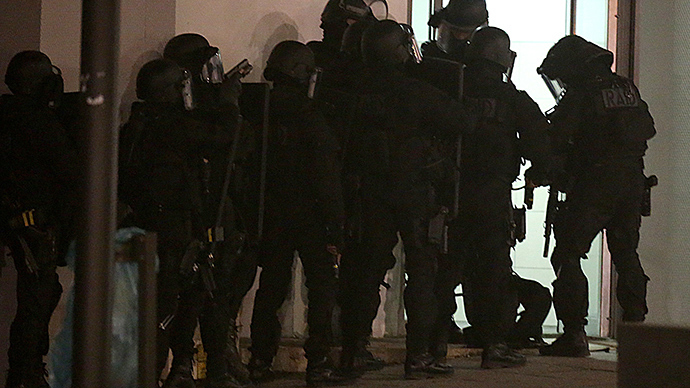 "Several were held overnight," France’s Prime Minister Manuel Valls told RTL radio. He said the suspects, who haven’t been identified by police authorities yet, were known to France’s intelligence services. Preventing another attack "is our main concern," added Valls. Earlier, authorities reported that one suspect had surrendered and two gunmen remain on the run after the deadly shooting in the French capital. The three attackers have been identified as Said Kouachi, 34, Cherif Kouachi, 32, and Hamyd Mourad, 18, AP reported citing French police. The names and photos of Kouachi brothers were later officially released by the authorities. The 18-year-old Hamyd Mourad reportedly handed himself in at a police station in Charleville Mézières after seeing his name on the list of shooting suspects on social media, French media reported. According to French channel iTele, Mourad claims to have alibi of his innocence, which is being investigated. 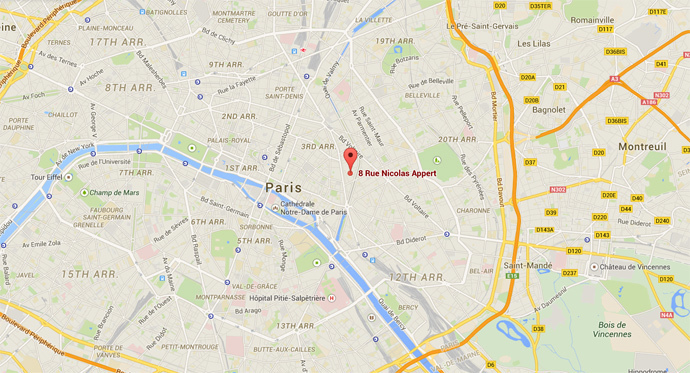 Earlier, police announced an anti-terror raid in the northeastern city of Reims, AFP reported. Dozens of police officers were dispatched to a site in the city, where one of the terror attack suspects reportedly lived. RT's Ruptly agency reported sounds of gunfire, citing witnesses in Reims, after a special police assault team surrounded a building in a council estate where at least two of the suspects were believed to be hiding. However, neither gunfire nor any arrests or casualties reported by various world media have been confirmed locally. According to iTele citing police, the Reims raid was a search operation only, and no suspects have been found at the scene. Live footage showed the majority of police officers who had entered the building leaving the site. “We are going in soon. Either there is going to be a shoot out or they have got away, tipped off by social media,” an unnamed police officer told AFP earlier. Police have arrested one man following another major raid in the northern commune of Charleville Mézières, iTele reported. The individual was detained for questioning as a relative of a shooting suspect, and is not a suspect himself, the French media outlet said. “Somebody who was nearby on the roof and saw much of the incident said three policemen then arrived on a pushbike,” Henry Samuel, the Daily Telegraph's Paris correspondent, told Sky News. Intense shooting broke out, with the gunmen fleeing the building and getting into in a black Citroen. They left behind dead bodies and a police van riddled with bullets. France's top security official said later there were three gunmen. Four famous French cartoonists were killed in the attack - Georges Wolinski, Jean Cabut aka ‘Cabu’, Bernard Verlhac aka ‘Tignous’ and Stéphane Charbonnier aka ‘Charb’. Several videos posted on social media showed two masked gunmen standing next to a black car on the Paris street shouting "Allahu Akbar" ("God is greatest") and firing shots at a police car. The footage came from the upper floors of the buildings next to Charlie Hebdo’s offices. “While fleeing they wounded a policeman and a passer-by was also hit,” the Daily Telegraph's Paris correspondent said. No terrorist group has yet claimed responsibility for the attack. However, an Islamic State militant praised the attack on the French satirical magazine on Wednesday. "The lions of Islam have avenged our Prophet," Abu Mussab, who fights for IS insurgents in Syria, told Reuters via internet connection. "These are our lions. It's the first drops – more will follow," he said, speaking via an internet connection from Syria. He added that he and his fellow fighters are happy about the incident. Mussab said he did not know the gunmen who carried out the attack, but added "they are on the path of the emir [IS leader Abu Bakr al-Baghdadi]....and our Sheikh Osama (bin Laden)." Reports suggest that the cartoons portraying Prophet Muhammad published earlier by the satirical paper were the reason for the attack. The gunmen reportedly called out the victims by name, shouting: “We have avenged the prophet." In November 2011, Charlie Hebdo published an issue with the Prophet Muhammad as its “guest editor”. The prophet, who Islam bans from portraying, was put on the front page saying: "100 lashes if you don't die of laughter." In 2005, Charlie Hebdo was sharply criticized by Muslims after it reprinted cartoons of the Prophet Muhammad from a Danish newspaper.